“Animals, gender, and culture: environmental, ethical, and critical perspective” is an anthology published in the PATTERNS Lectures Programme, which analyzes the complex relationship between humans and animals with both discursive examples, as well as those derived from visual and popular culture. The first part is comprised of translations into Polish of such well-known texts as “Report on Animal Turn” by Kari Weil, appearing for the first time in Poland, while the second is composed of attempts made by critical researchers and students (participants of the course) who, using a variety of theoretical tools, as ecocriticism, gender and queer theory, postcolonialism, feminism, ecofeminism and posthumanism, create a variety of multi-faceted perspective of interpreting endowed with the relationship between gendered people and animals as well as culture and nature. 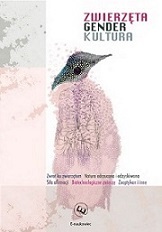 A look at the representations of animals in Polish culture through the prism of these theories produces interesting research material and presents new interpretations of cultural phenomena. This perspective gives also a possibility to go beyond the anthropocentric optics of many existing approaches in cultural studies.